Los Alamitos, CA – (September 2018) – Purple is the new orange…at the holiday table! The new crop of shoppers’ favorite Stokes Purple® sweet potatoes will start shipping in September, just in time for holiday ad planning and pre-book. 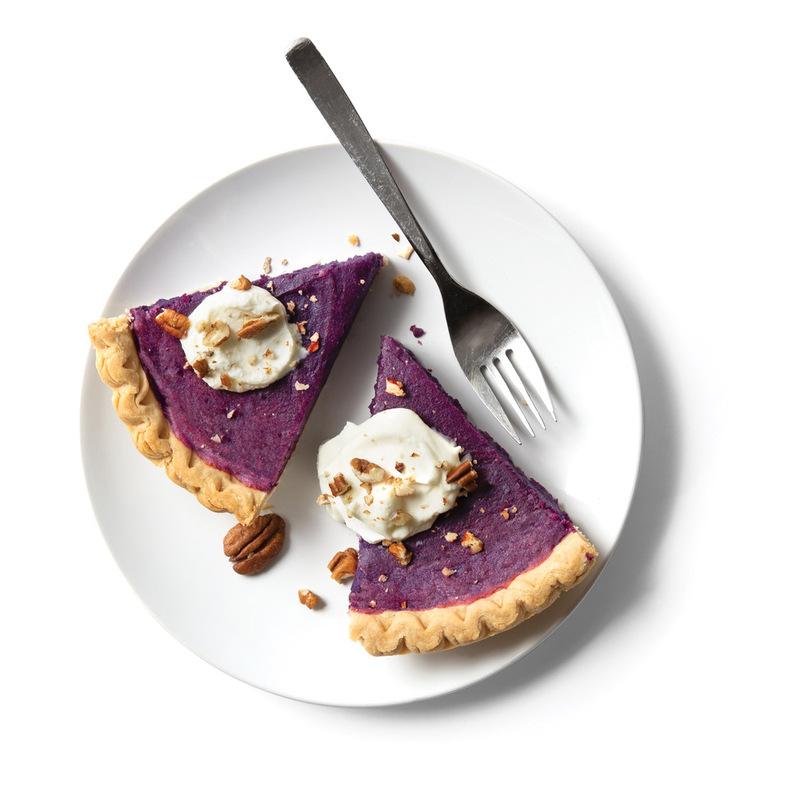 Stokes Purple® Sweet Potato Pie. Click for recipe. 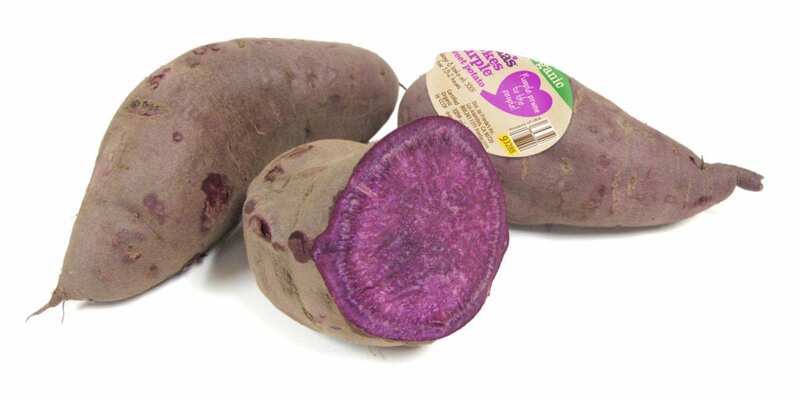 Pre-book Stokes Purple® sweet potatoes with a Frieda’s account manager today and explore other items for the new holiday table, such as colored cauliflower, rainbow baby carrots, celery root, and Cipolline onions. Perfectly baked Stokes Purple® sweet potato slices make excellent bite-sized toasts, ready to mingle with sweet or savory toppings. Line two baking sheets with parchment paper. Slice sweet potatoes into 1/4-inch rounds and add to large bowl. Drizzle with olive oil and sprinkle with sea salt. Toss to coat. Divide sweet potato rounds between two baking sheets; arrange in single layer so they crisp evenly. Roast sweet potatoes 15 minutes, then flip and roast 5 minutes more. When done, edges should be golden brown. Remove sweet potato rounds from oven and spread each with small dollop of goat cheese (about 1/2 teaspoon). Return sweet potatoes to oven for minute or two, just until cheese starts to melt. Transfer sweet potato crostini to serving platter and add desired toppings and drizzles. Enjoy a modern twist on the classic sweet potato pie recipe that is perfectly sweet with a hint of coconut. Purple is definitely the new orange! Preheat oven to 350 degrees. Bake pie crust 15 minutes. Meanwhile, in blender container or food processor, blend sweet potatoes, coconut milk, butter, egg, cinnamon, allspice, sea salt, sugar, and vanilla until smooth. If too thick to blend, add 1-2 teaspoons coconut milk. When crust is done, increase oven temperature to 425 degrees. Transfer pie crust to wire rack; carefully pour in filling. Smooth out top with spatula. Put pie back in oven and bake 15 minutes. Then, decrease oven temperature to 350 degrees and bake additional 15 minutes. When done, crust should be barely golden and filling should look set. Remove pie and allow to cool to room temperature on wire rack. Cover and place in refrigerator to cool overnight. Chill whisk and bowl from stand mixer (or regular bowl and whisk) in freezer at least 10 minutes. Pour heavy whipping cream, maple syrup, vanilla, and salt into chilled bowl and whip on high until peaks form, about a minute. It’s better to under-whip than over-whip! Store whipped cream in refrigerator up to 4 hours. Before serving, allow pie to come to room temperature. Just before serving, whip topping by hand to make it extra fluffy. Top pie with maple whipped cream and pecans. Slice and serve. *Note: For extra-creamy sweet potatoes, wrap in foil and bake the night before making pie. Store in refrigerator, still wrapped in foil, and use in recipe as directed. This gorgeous bowl of luscious, creamy sweet potato soup is pure purple comfort. Preheat oven to 350 degrees. Wrap sweet potatoes in aluminum foil and bake 1 hour, or until easily pierced with fork. * When cool enough to handle, peel sweet potatoes and discard skins. Roughly chop and set aside. In large pot, warm olive oil over medium heat. Add onion and 1 teaspoon salt. Sprinkle in cumin and black pepper. Cook onion, stirring frequently, 3-5 minutes, until softened. Add garlic and sauté 1-2 minutes. Add 2 cups broth and sweet potatoes. Bring mixture to boil, then reduce heat and simmer 10 minutes. Transfer soup to blender container and blend until smooth (or use an immersion blender). Add splash of broth to keep things moving, if necessary. If you use blender, carefully return soup to pot. Return to medium-low heat and add remaining broth. Stir in half and half or coconut milk, and add remaining salt. Season soup to taste. Top with sour cream, microgreens or chives, and chopped walnuts. *Note: For extra-creamy sweet potatoes, wrap in foil and bake the night before making soup. Store in refrigerator, still wrapped in foil, then use in recipe as directed.